“Jesus went to the district of Tyre. He entered a house and wanted no one to know about it, but he could not escape notice. The woman was a Greek, a Syrophoenician by birth, and she begged him to drive the demon out of her daughter. When the woman went home, she found the child lying in bed and the demon gone.” -Mark 7:24-30. Alexandrina of Ricci was the daughter of a noble Florentine. 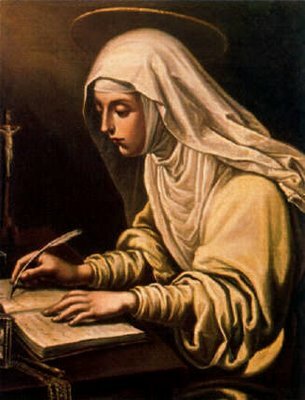 At the age of thirteen she entered the Third Order of Saint Dominic in the monastery of Prato, taking in religion the name of Catherine, in honor of her patron and predecessor of Siena. 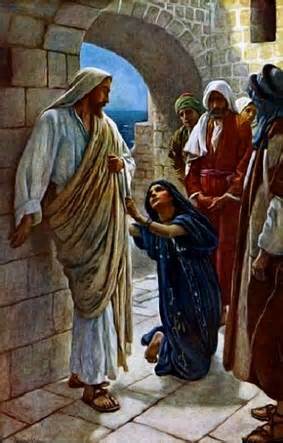 Her special attraction was to the Passion of Christ, in which she was permitted miraculously to participate. During the Lent of 1541, being then twenty-one years of age, she had a vision of the crucifixion so heartrending that she was prostrated and confined to bed for three weeks, and was only restored on Holy Saturday, by an apparition of Saint Mary Magdalene and the risen Jesus. During twelve years Saint Catherine passed every Friday in ecstasy. She received the sacred stigmata, the wound in the left side, and the crown of thorns. All these favors gave her continual and intense suffering, and inspired her with a loving sympathy for the yet more bitter tortures of the Holy Souls. In their behalf she offered all her prayers and penances; and her charity toward them became so famous throughout Tuscany that after every death the friends of the deceased hastened to Catherine to secure her prayers. Saint Catherine offered many prayers, fasts, and penances for a certain great man, and thereby obtained his salvation. It was revealed to her that he was nonetheless in purgatory; and such was her love of Jesus crucified that she offered to suffer all the pains which would be inflicted on that soul. Her prayer was granted. The soul entered heaven, and for forty days Catherine suffered indescribable agonies. Her body was covered with blisters, emitting heat so great that her cell seemed on fire. Her flesh appeared as if roasted, and her tongue like red-hot iron. She remained calm and joyful, saying, I long to suffer all imaginable pains, that souls may quickly see and praise their Redeemer. She conversed with the Saints in glory, and frequently with Saint Philip Neri at Rome without ever leaving her convent at Prato. She died, amid angels’ songs, in 1590.